Explanation: The auroral displays of the past week are being reported as some of the most beautiful in memory. In particular, impressive auroral bands fanned out over much of eastern North America after sunset on November 8. 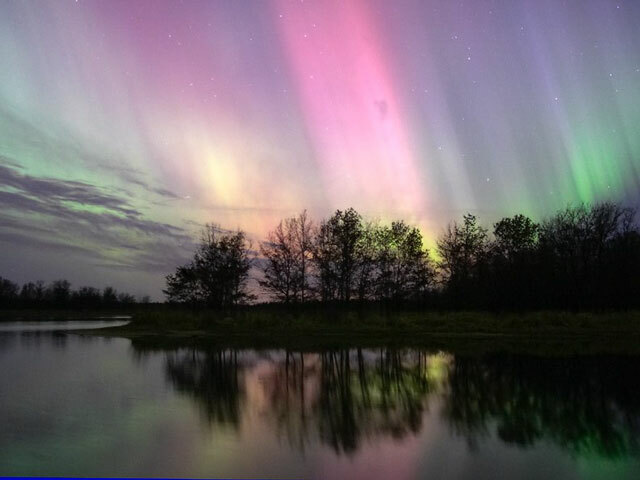 The multicolored aurora pictured above was caught reflecting in one of the many small lakes in central Wisconsin near that time. Continued solar activity might create more aurora visible over the next few nights as the Leonids meteor shower peaks. News flash: NASA air breathing jet sets new air speed record.